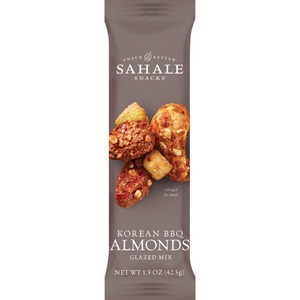 Korean BBQ almonds glazed mix offers delicious flavors of garlic, sesame, red chili, pineapple, whole roasted cashews, and almonds with a subtle kick of spice. Each bite delivers just the right amount of crunchy, chewy, sweet, salty and spicy flavors in perfect little clusters. Dry-roasted almonds and cashews are perfectly roasted using just hot air to develop sweet notes and a satisfyingly crunchy texture. And best of all, each bag is packaged quickly to preserve all that amazing flavor. Snack mix is perfect for impressing guests, boosting office morale, serving at company meetings and more. Almonds, Cashews, Dried Pineapple (Unsulfured Pineapple, Sugar, Citric Acid), Organic Tapioca Syrup, Sesame Seeds, Organic Fermented Soybean Paste (Water, Organic Rice, Organic Soybeans, Sea Salt), Organic Cane Sugar, Sea Salt, Brown Sugar, Rice Wine Vinegar, Spices, Shiitake Mushroom Powder, Dried Garlic, Cayenne Pepper.